Can We Mimic the Success Stories in Energy Savings? Over the last two months I’ve been collecting articles on energy that relate to many of the topics I write about in this column. At this point I have enough of them to share some recent developments and innovative programmes from around the world. But first I’ll start with a bit of a no-duh for anyone who has ever visited the United States of America. Forbes magazine reports, “America: The worldwide Leader in Wasting Energy.” Writer, Eric Savitz, suggests “Chronically low energy productivity – the level of output that our economy achieves from the energy we all consume – is costing U.S. businesses and households an estimated $130 billion per year.” I don’t know much about N.Z. business and industry energy-efficiency, but I would suggest that household energy waste here would be comparable per capita to the U.S. That’s the bad news. In another state, and another magazine (Yes!, probably a lot like NZ’s Good Magazine), Erin McCoy reports that Kentucky in saving power, cutting carbon emissions, and creating jobs by facilitating a win-win-win situation between homeowners, contractors, and the planet. A programme called How$mart provides home energy audits, works with contractors to perform the recommended work, and then checks the work to make sure its been done properly. The average How$mart home has cut energy usage by 20%. Translating the two articles above to a Wanganui context, this could mean $8.5 million in savings per year (homes only, not business or industry). In my opinion, the coolest thing about taking this perspective is that this money already exists in our community, and we don’t have to ‘attract new dollars’ as Council seems continually trying to do. Instead, we would be retaining dollars now sent to power companies in Auckland, Christchurch or Wellington. The other cool thing is that investments in energy savings today pay themselves back at faster rates in the future as power prices rise. In other words, the faster rates rise, the faster energy-efficient investments pay for themselves through savings. For example, under ‘normal usage’ a compact fluorescent light (CFL) bulb now pays for itself in about 6 months (200% return on investment!) As electricity becomes dearer, the payback period for CFLs gets shorter. Now the bad news – not so cool – comes from an article I read in the Herald on Sunday, 10thMarch in Nelson’s Café in Stratford. 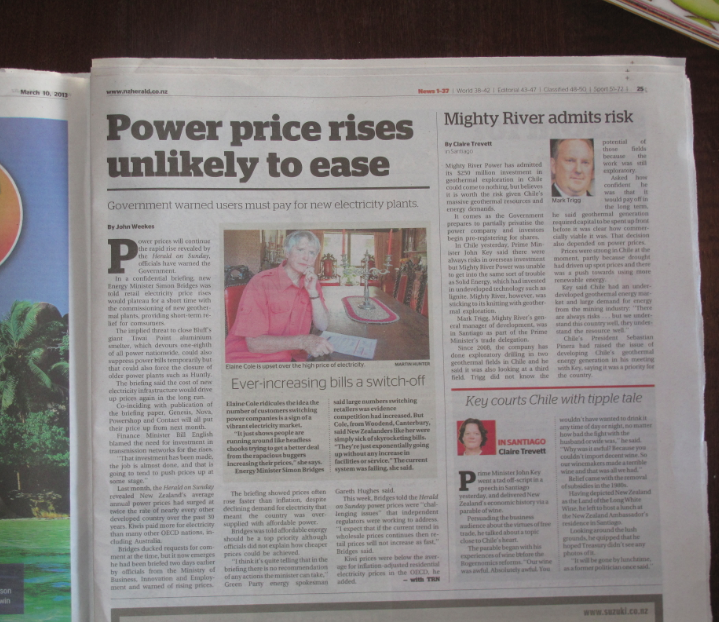 The headline: Power price rises unlikely to ease: Government warned users must pay for new electricity plants. Given my observations on governments’ ability/inability to embrace sustainability (shared in last week’s column), and my experience with innovative power programmes overseas, I would argue that a simple strategy of eco-thrifty education/incentives/management would render this headline unnecessary because saving power is cheaper than producing power. Take the 34 million kWh potentially saved in Wanganui per year, and add Feilding, Marton, Bulls, Turakina, etc. and the amount saved is more than the output of a new electricity plant, and at a fraction of the cost. Does that make sense? The power companies themselves were pushing this type of strategy 25 years ago in Massachusetts, USA, and reaping the financial benefits of not building costly new plants. But here we are 25 years later in ‘clean, green New Zealand’ and the main strategy appears to be building costly new plants. Does that make sense? At this rate, N.Z. may replace the U.S. in the Forbes headline at the top of this piece: “The worldwide Leader in Wasting Energy.” Unlike our All Blacks, Black Ferns, and the recent Black Sox world championship victory in Auckland, I suggest this is one category we may not want to be number one.